Whatever the reason, we provide them with emergency services such as temporary housing, food and medical treatment. We can provide housing for a maximum of 35 dogs and 70 cats at any given time. We also try our best to find new permanent homes for our residents. Each year we adopt out approximately 200 cats and dogs. 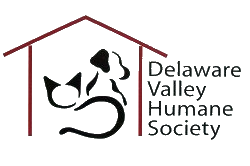 1964- Delaware Valley Humane Society is organized. Received charter in March of 1965. 1994- Terry’s Red Barn was purchased to conduct fund-raisers. 1998- Large remodeling project throughout the shelter. 2003- Large cat room/isolation area added to the existing structure. 2012- New bridge over the creek through the Eagle Scout Program. Added an outdoor play pen. Replaced roofs and fencing at out facility. 2015- Received a Grant to install solar panels.